I’ve added details of my most recent game, Tiny Epic Battles, to the Games section of this site. The Playful Learning Special Interest Group, that I co-chair with Nic Whitton, holds meetings each year in Spring and Autumn at different institutions around the UK. This allows existing and new members to join a meeting close to them, and also allows us to build on our thinking and ideas each time. Last week we were hosted by Rosie Jones at the Open University’s Betty Boothroyd Library in Milton Keynes. Rosie has been a member of the SIG since its inception, and she and her talented team were the perfect hosts, preparing clever escape room challenges within the library for us when we arrived (thanks Cathy!). We had our highest number of attendees, with 20 members (a good mix of veteran and new) traveling from around the country. Together we play-tested and discussed several new games and approaches from individual members (Amanda Hardy’s flexible Moodle Deck of learning design cards; Andy Walsh presented the work around using playful challenge cards with teams, that myself and Rosie have also been working on; and Katie Piatt crowdsourced questions from us for an upcoming sector chat about playful learning). Ellie Hannan took us through a full session of her very clever SOTL game (see blog post from an earlier playtest) which increased our knowledge of research methodologies and saw us funding TV reality show research with dodgy ethics. We also helped Nic Whitton develop her very useful work around typologies of play, by looking at hundreds of images of activities to decide if they were playful or not. Thanks to everyone who came and joined in the thinking, creating and play! The next live PLSIG meeting will be in May 2018, in Leicester. If you’re interested in joining the SIG, see the Playful Learning Special Interest Group. I encountered Play14 thanks to two good friends of mine (Esther and Franc of Traico Projects) deciding to host an event in their home city of Barcelona. 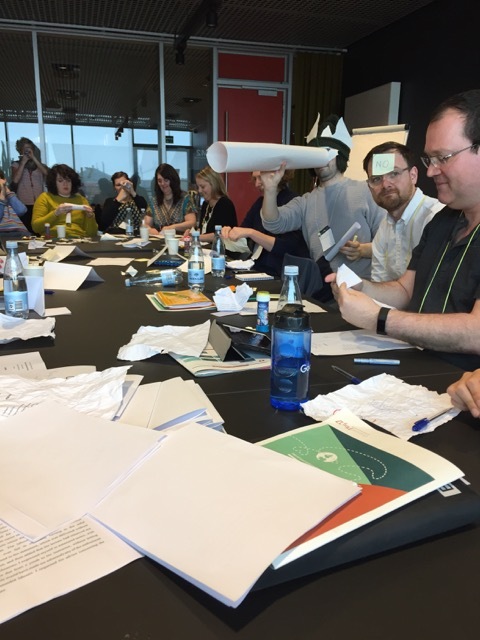 Here was a chance to (a) meet playful people from business, arts and education; (b) find out about the open Play14 ethos; and (c) get to explore Barcelona if time and space allowed. Barcelona itself was in an edgy mood of course, but the people and demonstrations I encountered across the city were so friendly and curious to step into the unknown, that they set a great playful-yet-serious backdrop to the event. 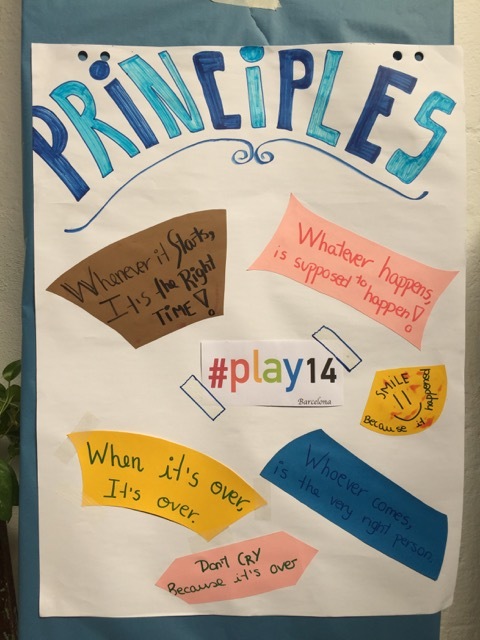 Play14 is based on the ‘open space’ unconference model, where participants propose sessions to create a programme each day, and then decide what they want to join in with. We were based in a fabulous space in the heart of Barcelona, just down from the stunning Sagrada Familia, with two large rooms and two small breakout spaces. 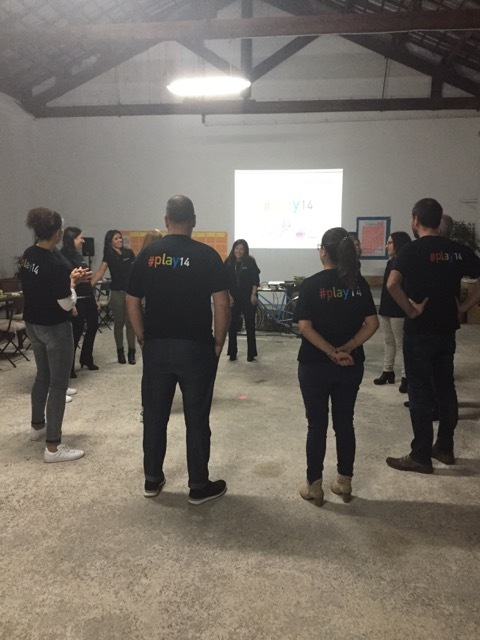 Play14 also has its own overriding ethos, which Yann Gensollen (one of the founders) was there to introduce – and this merged with the open space approach perfectly to create an open, sharing, curious and collaborative atmosphere. Over the three days I collected many ideas for ice-breaking, team-building and reflective activities (littered between and in the session programme), explored the use of ‘escape’ games for student training, played and discussed The Ball Point Game (see it in action) for management training, used my touch and taste only to explore an alien world, and created shoe towers to harness creativity. I also playtested a new game I’ve designed to test the effectiveness of group sizes from one to 16 working on a common aim: Tiny Epic Battles. It worked really well (with evil triumphing good both times in epic fashion), but what was brilliant was having several colleagues there who I could discuss the gameplay and approach with: and I’ll be following this up with one of them who saw potential for its use in behavioural psychology. More news on this in the coming months. 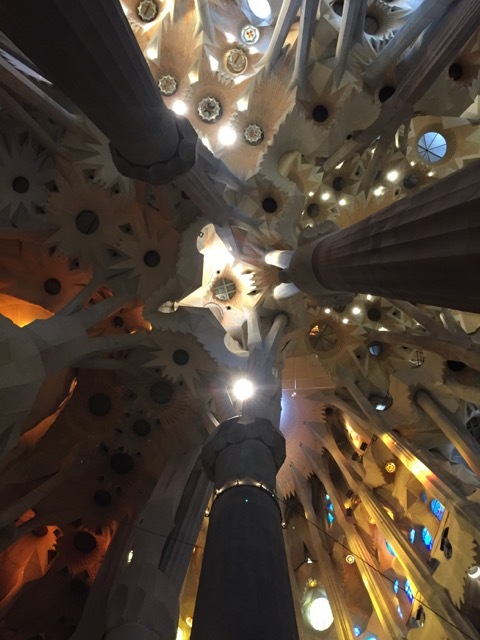 We became such a close knit team straight away, and so headed out together in the evenings for meals and more playful discussions: allowing me to get a good taste of the city too, and marvel at Gaudi’s contribution to the landscape. All in all it was a really useful and interesting trip, and I fulfilled all three of my aims. Thank you everyone at Play14, and particularly Esther, Franc and Yann for being such perfect playful hosts. The first meeting of the Work-at-Play-at-Work Society met at Counterplay 2017. I’ve been thinking a lot about the ‘invitation to play’ recently: what invites people to engage in playful activity; is it different for each person? And then what allows them to continue playing? There was a formal agenda, as attached here. Once all members were in the room (excluding Valerie from Admin, who forgot to come), we began with Apologies. Members were asked to apologise for something distinctly un-playful they do regularly at work. This slightly playful twist on proceedings produced some surprisingly revealing apologies: with people admitting to ignoring what goes on in most meetings; avoiding speaking so as not to prolong the meeting, etc. Introductions were next, and we went around the table so that all members knew who was represented. Everyone was given a name card (eg. Luna, Erik…) and the person opposite was asked to give them a job title and department. To the left of me I had Algernon the Management Financial Analyst from the Department of Financial Management Analysis; to the right of me I had Xavier, a shadowy figure from ‘up above’, who cast an acusative eye over the whole meeting. Members were reminded of their action points from last meeting, and asked to report on them later in the meeting. I had created a set of secret Action Cards, one for each person. Over the rest of the meeting, it was really interesting to see how they each approached their actions: one member winked at another via twitter, for example. 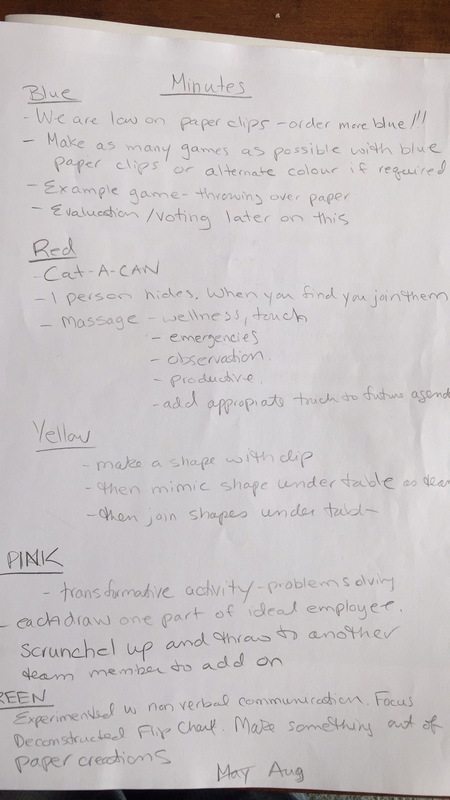 Others used the following activity to mask their missions. We then found that Valerie had mixed up the Minutes from the Last Meeting, and they were distributed across the papers in front of each member. It took some time to get them back into some sort of order. I had taken the first 50 pages of Frankenstein from Project Gutenberg, and mixed them up across the 24 paper packs. There were some clues (the start page, end page and some chapter breaks) but everyone was soon up trying to match their pages with others, lay them out on the side, etc. By the end of these last two activities, everyone knew everyone else in the room, which made the following exercises much easier. The main section of the meeting was a design exercise. Members were formed into small groups, and asked to design meeting activities together. Members engaged actively with this exercise. I’d used different colour paperclips on each set of papers, strategically placed around the table, so that some groups were near to each other, but others had to work across the length of the table. Their task was to design a playful activity using only materials in the meeting room. Things got very playful, very quickly. Link from Dog Grooming fortunately took good minutes in the absence of Valerie, which you can see here. I was particularly impressed with the idea of massages as a reward; and the use of the underside of the table for secret meetings. Members then shared their activity ideas, and the meeting attempted each one to test its effectiveness. The meeting ended with arranging the date of the next meeting (after failing to find a free slot in all 24 diaries within the next year we used the time-honoured and always successful method of arranging a Doodle poll). 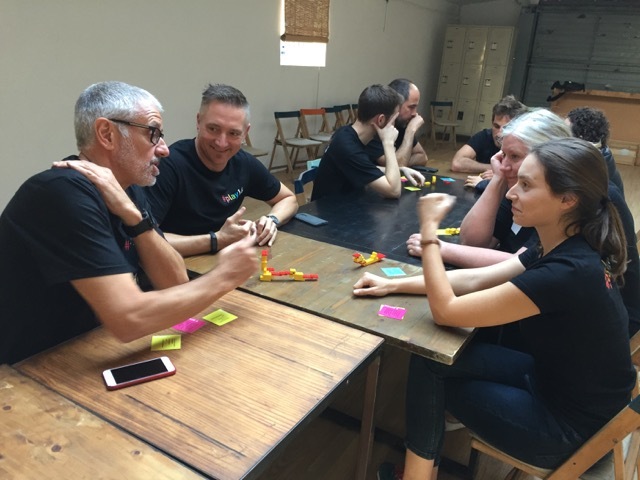 A simple experiment, which started with a few simple playful twists on the traditional meeting, took on a life of its own when the participants accepted and ran with the invitation to play. I was hugely impressed with the work everyone put in to create such inventive activities, and to complete their own secret actions; probably more work – certainly collectively – than any business/committee meeting in history. Following my research and teaching trips, culminating at the harbour of the increasingly beautiful and cosmopolitan Aarhus, I arrived in plenty of time for the beginning of Counterplay 17. Not that I needed to worry, as the wonderful Mathias Poulsen (who almost single-handedly forms this playful bubble into existence each year) opened proceedings by telling us that playful people tend to be late. This was followed by a blast of an opening by Anthea Moys, who herself arrived late on the stage – climbing and apologising to everyone she trampled over; and then proceeded to ask us to do the same, to find our actual seats. When we found them, we had to draw our neighbour’s faces without looking down at our paper. A great start that set the tone for the whole conference, this was just one of Anthea’s examples of her incredible playful art projects in Johannesburg. She mastered twelve different sports and then played, single-handedly, against twelve first teams. Her aim was to accept and stare failure in the face; and redefine success as the act of learning and playing, rather than failing to win. An approach that resonated with many, and created ripples of discussion about failure over the rest of the day. Gwen Gordon followed Anthea; a former Muppets puppeteer, who now uses play to improve lifestyles. My session was next. I’m currently interested in the ‘invitation to play’; or what causes people to accept a playful activity, or reject it. I therefore had an idea about introducing elements of play into a non-playful scenario played out in every institution across the world: the board/committee meeting. We started with Apologies (apologising for something non-playful we do within our jobs), Introductions (giving each other fictitious names and roles) and the minutes of the last meeting – the 50 pages of which happened to be distributed across each attendees’ pack in random order. 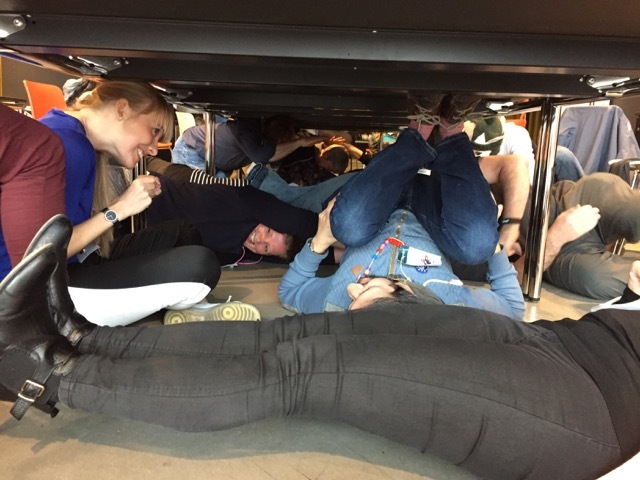 After that, things got very strange; as attendees tried to complete secret missions whilst creating their own playful approaches within the meeting room. It was really difficult to remain seated and straight-faced, as I decided the Chair should do. 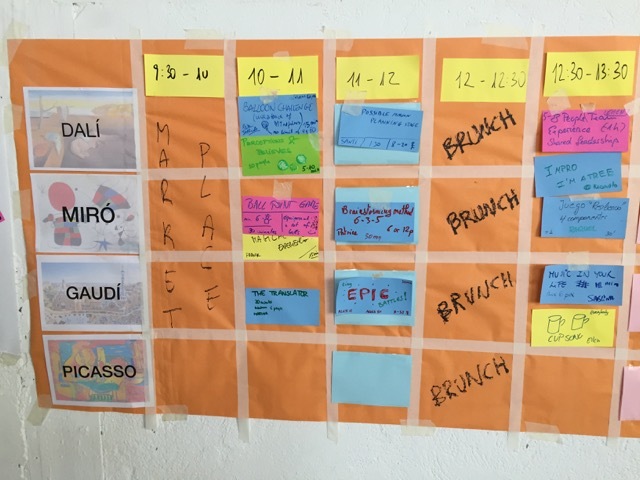 After lunch, and meeting up with old and new friends from across Europe, I attended Luca Morini‘s session on playfully hacking serious systems. Luca had us exploring the fabulous venue of Dokk1 (the huge and open public library that Counterplay occupies, in amongst the daily life of thousands of local students and families) in order to find places that were closed to us, for some reason. He used this as a way to introduce his idea that formal systems are game-like: they follow rules and states – and therefore can be gamed themselves. An energetic keynote next from Portia Tung, who shared her approach to introducing play into corporate boardrooms. And then it was time to launch the first Counterplay book, The Power of Play, including articles, games and activities from many attendees of last year’s conference (myself included). It’s a beautiful, thoughtful and creative book – which I’m still leafing through and finding new interesting things to do and think about. In the evenings we all headed to the excellent new Aarhus Street Food area, with stalls selling food from around the world, and good local craft beer to match. It was here that much of the creative thinking and networking went on each evening. Day two dawned, and two of the people I’d been talking to at length in the evening were speaking: Kirsten Anderson, who had us all blowing bubbles; and Dom Breadmore from Coventry University, who gave a great talk about the invitation to play, and the importance of designing playable experiences, rather than playful ones (more agency in the former, when they invite interaction). 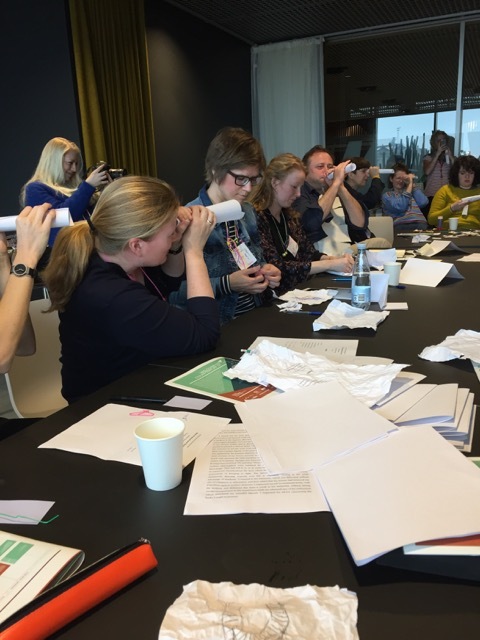 I spent the rest of the morning exploring all the activities around Dokk1 outside the formal programme, including catching up with Rikke and Claus from Coding Pirates, who were working with children on creating Viking-themed games. After lunch we became future explorers, heading out into the city in small teams to help Eva (a fictional character we created based on the hashtag #finding4eva) create a map of future elements within the city. This was part of an ongoing project by Dan Barnard, and gave us a new way to explore the city’s hidden areas, as well as thinking about environmental issues and future planning. Also, our team won (yay!). It was then time for the final keynotes. Lena Mech followed the theme from the earlier workshop by using examples of playful work in cities to suggest that the invitation to play is more complex than we might think: we shouldn’t, she suggests, be arrogant in thinking that everyone can play, and should instead use ludic markers to tempt them in: whether human activity, or physical attributes in the landscape. Finally, returning four years on after his first (excellent) keynote at the first Counterplay, Miguel Sicart was back to pace the stage again. Like a prowling tiger, Miguel added what – in my opinion – could have been the last chapter of his book: a call to arms. He used examples of playful/creative groups that have worked against dictatorships or regimes to show us that small personal or group actions can start to work against dominant negative forces. A fabulous finish to the formal programme. 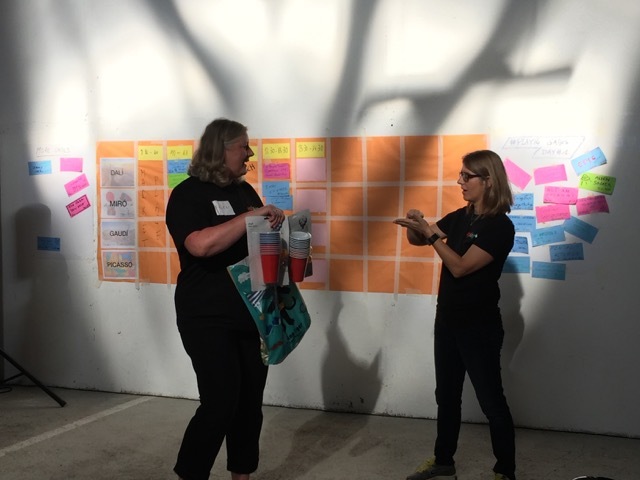 As last year, there was a further day of creative play following the main conference – so about half of us returned on the Saturday to consolidate our thinking around this year’s emergent themes. My group was thinking about setting seeds and growing playful approaches outside of the conference; and we came up with the idea to connect different people together with a tangible artefact – a package that would be sent between us with something to apply to our own context, and then add something else before sending it on (see Marian’s explanatory post). In amongst the thinking, I also attended a final session by Mikel Haul, who has been researching the origin and development of the Chase the Goose popular game from the Ancient Greeks. His plan is to create a physical version of the board game, including its iconic squares (such as death, or the well), at spaces in Middlesborough, Tokyo, and Aarhus: and so we helped him by mapping out the board over the circular levels of Dokk1. And that was it, although many played on well into the night – and through the flights home. It was, yet again, an incredible experience: almost all due to the people who attend from across the world with a common ethos – I made many new friends and colleagues who I’ll be carrying on the thinking and conversations with as the year progresses. Huge thanks to everyone who was there and made it such an incredible experience – and in particular to Mathias and his team of helpers, without whom this wonderful event wouldn’t occur. 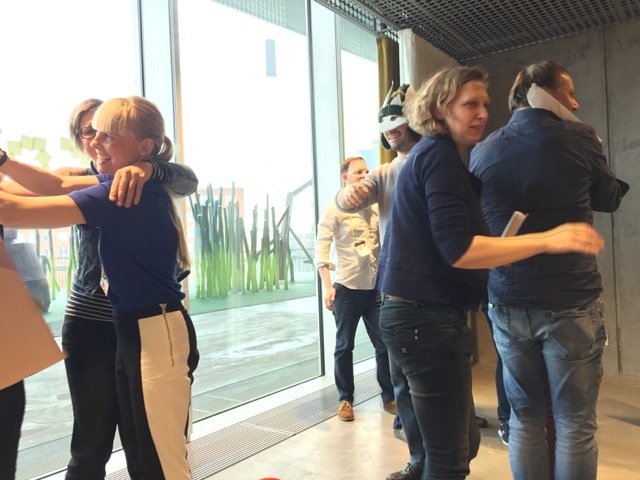 Over nine days at the end of March, I was honoured to be invited over to Denmark to work on two projects connected to my research and teaching. The first was the HistBattles project, being developed at the wonderful Lolland-Falster museum in Nykøbing Falster (on one of the two southern-most islands of Denmark). Erik Kristiansen, who I had worked with on the Transforming Thresholds project, is leading a project to create twelve alternate reality games (ARGs) to teach the local history of the islands to 13-18 year olds. A rune stone at a church on Lolland island; one of the sites for the game. Each ARG will cover a period of Danish history, and will be connected to one of the sites covered by the museum across the two islands. I was there to help scope out a framework for the game, and to help local staff start to design the puzzles and meta game. No further spoilers, but I’ll post more details as the project develops. The aim is to launch the first game in the Summer. The second project was a guest teaching role at Aarhus University, firstly for the Centre for Teaching Development and Digital Media (CUDiM) – where I talked about online learning and curriculum design for the digital age; and then as a guest speaker for the House of Game//Play and Game Design Masters course, I ran a talk/workshop around Alternate reality and pervasive games. Both days were really interesting, with engaged students and staff entering into some deep discussions around both areas. The organisers, Rikke Toft Nørgård and Claus Toft-Nielsen, then introduced me to their Coding Pirate workshops, where younger students (9-16) were creating their own computer games, and building mazes for robots and LEGO models. My thanks to Rikke, Claus and all the students and staff at the Centre for such an interesting and welcoming two days. Students playing my ARG-cards game. All of this playful activity was the perfect precursor to Counterplay 2017, which I’ll be reporting on in a following post. 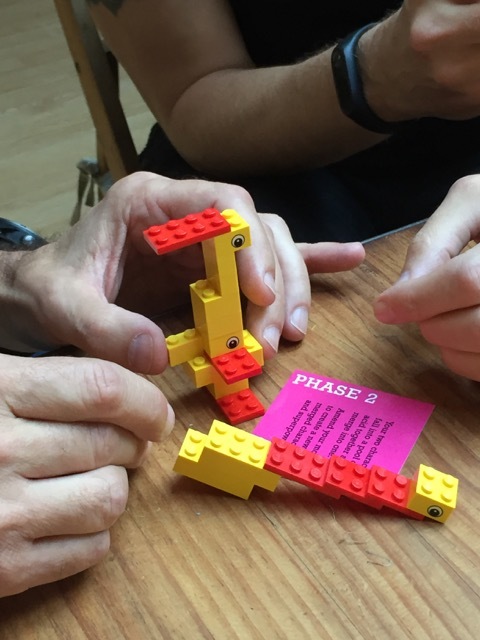 Playful Learning is returning to Manchester this July, following a very successful first year. Designed as a playful alternative to the traditional conference, Playful Learning focuses on the application of play and games within adult learning, and we welcome anyone interested in this area – whether Higher and Further Education teachers, researchers, trainers and students; library, museum and local government education officers; workplace trainers; educational designers; learning technologists; in fact anyone involved in adult learning who has an interest in engaging people through play. We’re planning a range of activities that take place around the timetabled sessions, but are also still inviting session proposals for the main timetable. Registration is also now open – see http://conference.playthinklearn.net/ for details. Alex Moseley is Head of Curriculum Enhancement at the University of Leicester and a National Teaching Fellow; he is also a Visiting Fellow at the Centre for Higher Education Futures, Aarhus University. He is a course designer, and conducts research in playful learning for adults in education and museums. He also teaches innovative courses in History, Archaeology and Museum Studies, and is a Certified LEGO® SERIOUS PLAY® Facilitator. He chairs the ALT Playful Learning Special Interest Group, and co-organises the Playful Learning conference. Moseley, A. (2018) "Real-Life Contexts in Learning Games: Towards a New Typology" in IJGBL, Vol 8(4) pp18-31. Parry, R., Moseley, A. & Page, R. (2018) “Museum Thresholds: the design and media of arrival”. Routledge: New York. Moseley, A. Guest Ed. (2017) "Special issue on Playful Learning", IJGBL, Vol 7(3). Moseley, A. (2017) "Cloud or Dinosaur? An Invitation to Play" in Poulsen, M. ed. "The Power of Play". Moseley, A. & Whitton, N. Guest Eds. (2014) “Engagement in Simulation/Gaming” special issue of Simulation and Gaming, Aug-Oct 2014; 45 (4-5). Keynote: Moseley, A. (2018) "Play in Dark Places". ICEPOPS Information Literacy symposium, Liverpool, 3 April 2018. Co-chair, Playful Learning conference 2018, Manchester, 13-15 July 2018. Moseley, A. (2017) "Work-at-play-at-work". Workshop at Counterplay 2017, Aarhus, Denmark, 30 March - 1 April 2017. Co-chair, Association for Learning Technology Annual Conference (ALTC) 2016, Warwick. Keynote Speaker: Moseley, A & Whitton, N. LILAC Conference 2016, Dublin, Eire, 21-23 March 2016. Moseley, A. & Whitton, N. (2016) "Designing Cheap and Effective Games for Learning". Workshop at Counterplay 2016, Aarhus, Denmark, 14-16 April 2016. Invited speaker: Moseley, A. (2015) “Increasing student motivation and participation through games and gamification”. Inside Government Symposium on Mobile Learning, London, 8th July 2015. Co-Chair (with S. Warburton), In Focus: Games, Gamification and Games-based Learning: A Symposium. Senate House, University of London, 4th March 2015.